Did it ever cross your mind that you will witness that day when Back to the Future's iconic hoverboard will become a reality? No, we're not talking about that self-balancing scooters with wheels and just glides on the floor, though. For several decades, inventors have tinkered with the idea of inventing a machine that approximates the definitive hoverboard. Two years ago, there was a video on YouTube of a "hoverboard" , presented to the public. The device was introduced by no less than Christopher Lloyd, the actor who played the role of an eccentric scientist in the movie Back to the Future. It was tested and modeled by professional skateboarder Tony Hawk. Named the HUVr and developed supposedly by HUVrTech, the hoverboard was tried by Tony and some other people in a parking lot. The video became viral and gained more than 17 million views up to this time. Many people were in awe and wanted to try the hoverboard, while some said the video was obviously a hoax. A few days after uploading the video, Tony posted another video on YouTube wherein he apologized and revealed that the video was just a prank. 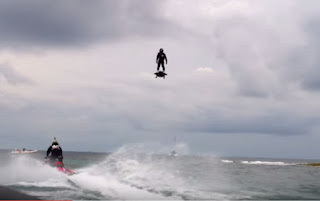 It's in this kind of environment that French ski jet champion Franky Zapata published a video more than a month ago, titled Flyboard Air Test 1. Zapata was shown "flying" flawlessly while standing on his machine. It's not surprising that a lot of viewers did not believe the video was authentic. What's astonishing about Zapata's video is the height and speed achieved during the air test of the sleeker hoverboard. He reportedly achieved a maximum speed of 55 kph. Though the height wasn't specified, the video pretty much shows that he was at least 20 meters up in the air with the device. 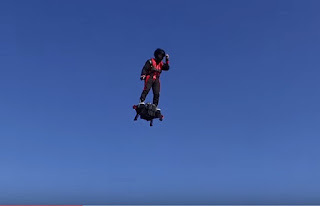 On April 30, Zapata broke Duru's Guinness Record for hoverboard flight, traveling a distance of 2,252 meters, 8x more than what Duru accomplished. He also achieved a height of 50 meters with his hoverboard. 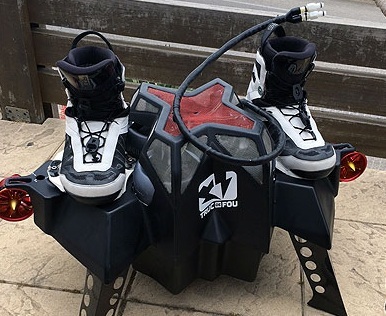 In terms of appearance, the machine looks pretty similar to Zapata's earlier invention, the Flyboard, a watercraft which others describe as a water jetpack. The Flyboard has a long hose attached to a watercraft, which propels it underwater and on air. Except for the long hose, both the Flyboard and the Flyboard Air look very similar from afar. Duru and Zapata has opened a new frontier when it comes to aircraft travel. The hoverboard, more powerful than the one foretold by the movie, Back to the Future, has finally arrived. Its impact may not only be felt in travel or transportation but also in exploration, security, and defense. So, will we see flying cars soon? That may just come true, sooner than we think.